Hermanus Forest Adventures a division of SA Forest Adventures (SAFA), can now boast with an activity that caters to guest not only during the scorching summer months, but delightfully during the boring winter months. You no longer need to sit in doors and glance out the window wondering what to do. The brand new activity rafting and tubing offer endless enjoyment, as you cascade down the mountainside, different drops and tumbling mini falls . 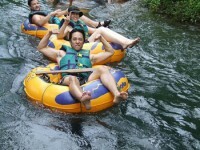 The rafting / tubing unfold on numerous rivers, which snakes along small boulders and vegitation, providing the ideal ambience for this activity. The rafts are two seater inflatable kayaks and the tubes, single seaters. The duration of the trip can be regarded in the rafts as approximately 2 – 3 hours, and the tubing 2 – 4 hours all depending on the flow of the river. The scenery is breath-taking as the mountains tower over you, and the lush green nature reserve stretches as far as the eye can see. The smell of fynbos cloaks around the river, as insects buzz and sound of wildlife echo off the gorges. 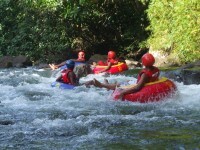 Tubing is provided during the summer months, while rafting is expected during winter. Professional guides lead you on this adventurous ride of a life time, but bookings are essential. Relax and for a few hours forget about the hustle and bustle of the city. Posted in Tubing & River Rafting and tagged Arabella, Kleinmond, Palmiet, rafting, tubing, white waterwith no comments yet. 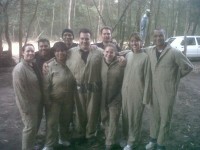 Our latest Team building group! African Pride Crystal Towers Hotel & Spa, where innovative, modern design meets timeless sophistication and luxury. The hotel boasts the second-largest conference and convention venue in Cape Town, after the CTICC. Centrally located in the heart of the Century City urban hub, African Pride Crystal Towers Hotel & Spa is settled beside a palm-lined canal, and boasts views that stretch out towards the majesty of Table Mountain. Situated a mere 15 minutes from the airport, city centre, V&A Waterfront and the start of the luscious Cape Winelands. African Pride Crystal Towers Hotel & Spa offers GUESTS complimentary daily shuttles to and from the V&A Waterfront, Table Mountain, Camps Bay & Clifton Beaches. Please contact the hotel directly to enquire about the set departure/collection times. The Hermanus Farm - SA Forest Adventures had a awesome time hosting GM Gary Koetser and his team from Cape Town!! Posted in Team Building and tagged African Pride, Crystal Towers Hotel & Spa, Gary Koetserwith no comments yet. 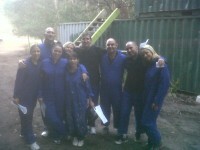 Posted in Uncategorized and tagged Adventures, Caledon, Cape Town, hermanus, Ziplinewith no comments yet. Mar 27th Caledon Adventure Farm now open!!! Posted in Uncategorized and tagged Caledon, Hermanus Forest Adventures, Sa Tourismwith no comments yet. Mar 13th Race your Company or Friends! Why not challenge your company to a day at the races! Our venue gives you the complete off road go-kart experience. We have 2 options on the rally experience. Race our pipe cars around the track. The pipe cars are the largest of the off road go-karts in our fleet and handles better than the smaller go-kart. This Go-Kart delivers a good all round experience but the let down is the maximum speed of 60 km/H. The roll cage (never needed so far!) also creates a safe environment. This one seater – off road go-kart track gives 4 + competitors at a time the experience to race, while the rest of the team is seated in the pavilion and grass banks. This track has been laid out for full entertainment and team events. The teams can have a relay while having a braai or spit next to the track, in full view of all the action. We would like to thank you for the excellent teambuilding experience that was provided in the form of the Amazing Race (through Hermanus). The organisation was impeccable and the myriad of challenges ensured that the teams were always thinking and needing to effectively communicate with each other (and that of the public). The nature of the challenges ensures that different parts of your brain are needed throughout the day which ensures that at some point in the day every member of the team is the weakest link or the strongest link. We strongly recommend this to anybody who wishes to have a fun, challenging (physically and mentally) and competitive teambuilding outing. The proof is always in the pudding and as the entire team feel asleep in the bus on our return to Cape Town I would suggest that it was a success. Remember to bring a blanket and a pillow to sit on. Music entertainment to end at 21:00! Please visit the Theatre section on this website for booking information! R220 p.p (none reserved)Chair seating at the back of the venue. Remember to bring a blanket a pillow to sit on and a SMALL FLASH LIGHT! More details can be found on the Theatre Page of the Hermanus Forest Adventures Website. Posted in Uncategorized and tagged cape whale coast, hermanus, Hermanus Forest Adventures, Kleinmond, watershedwith no comments yet.